Once the eBay integration has been authorized and activated, orders will begin to download as of the download start date. Any orders in eBay dated prior to this will be ignored. Each download will check for new orders within the last seven days - but restricted to those after the order download start date. Deactivating then reactivating the channel will not change the order download start date. This means that the integration can be deactivated to put the order download on hold, and as long as it is reactivated within seven days any orders placed during this time will download. Reauthorizing the eBay account will reset the order download start date. eBay alerts your Brightpearl account when a new order is taken, this triggers Brightpearl to automatically download the order. A download can also be manually triggered from the recent sales list in Brightpearl, but this download is subject to the above restrictions. An automatic download looking for any missing orders will be carried out twice a day. This ensures that, if for any reason, an order was not successfully created in Brightpearl that it will be captured. How long does it take for an eBay order to download into Brightpearl? The majority of orders download within an hour of being placed. It is therefore recommended that this is considered when setting cut offs for next day delivery times. For example, if orders are required by 2pm for next day delivery, a safe cut off time for eBay orders is 1pm. Occasionally the factors mentioned above could cause a small percentage of orders to take longer than an hour. Brightpearl will create the order as soon as the required information has been provided and it is picked up by one of the three download triggers. There is an option to only download eBay orders once checkout is complete, this happens when a payment is received (include part payments and cash on delivery). This means that Brightpearl will capture only the most up to date information on the order and download the final version of items into a single order. This will help to ensure items for the same customer are shipped together where they have committed to buy multiple items separately. Turn on this option within the eBay channel settings at Channels > eBay > Settings. Leaving this option unchecked will mean no changes to the way the eBay order download currently works, which is downloading orders as soon as the customer commits to buy an item, even if they have't yet paid. This ensures that stock is reserved as soon as possible but can result in multiple orders being created where the customer purchases multiple items (using commit to buy over add to basket). "Commit to buy" or "Buy now"
An order is created in Brightpearl at the point the eBay buyer clicks "Commit to buy" (using the "Buy it now option). This is the case even if the customer pays for the items all together. When this occurs the payment will not be auto-allocated to the individual orders in Brightpearl - it will need to be done manually. Note that is is not possible to manually merge these orders in Brightpearl as the connection to eBay will be broken. If this happens the items will need to be manually updated as shipped in eBay. To avoid multiple orders and failed payment allocations when this occurs it is recommended that the eBay channel is set to only download paid orders. Sometimes, when customer places an order, a payment will be sent as an eCheque if their PayPal balance is not enough to cover the payment and they don’t have a credit or debit card linked to their account. Please note that eCheques are not instant payments. It usually takes between four and five working days for an eCheque to complete and the money to appear in the recipient’s PayPal account. Brightpearl will capture PayPal eCheques on order download instead of the clearing of the check. So, even if 'Download only paid orders' setting is turned on, Brightpearl will still respect what eBay sends and download an orders paid via PayPal eCheque as unpaid. Note: Seller may not block eCheque payments on eBay. A single order is created for all items when an eBay buyer places items into their basket/cart and uses the checkout. In this case all items are contained in a single order and the single payment can be automatically allocated in Brightpearl. Note: Multiple orders will be created when the commit to buy option is used by the customer. See above. If the order has already been shipped in Brightpearl the changes will still be made to the order and an integration alert will be created. Order updates effecting the order rows (i.e. shipping charges) will not be made in Brightpearl once the order has been invoiced. For this reason, we recommend that invoicing is only done once the order is complete - it has been paid and shipped. If a customer wishes to change the items they have purchased, best practice is to cancel the order in eBay and refund the customer. The order will also need to be manually processed as a credit and refund in Brightpearl. A new order can then be placed. If the order is simply edited in Brightpearl, those changes will not be reflected in eBay. However, as long as the customer reference field contains the eBay listing ID and order reference the order will still be marked as shipped (once shipped in full). 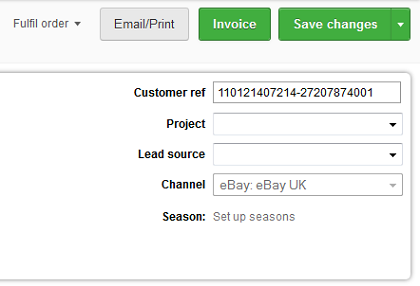 When an order downloads from eBay it will search for an existing contact using the customer email address. If an existing customer record is found the order will be created against that record. If any details of the customer have changed, such as address, they will be seen on the new order but will not update the contact record. If no contact is matched in Brightpearl a new customer record is created and the order will be created against this record. New contacts are created using the eBay buyer first and last name. The eBay customer username wil be recorded in the aliases section of their contact record. Where the eBay listing is connected to a product in Brightpearl that item will be added to the downloaded order. If inventory is available for that item then it will be allocated to the order. If the eBay listing is not connected to a product in Brightpearl then a miscellaneous and non-stock tracked line item is added using the item name from eBay. Miscellaneous items cannot be marked as shipped and therefore will not update eBay with shipping details. If a product record does exist that item can be swapped onto the order instead and the order processed as normal - all shipping updates will be sent to eBay. Where an eBay listing is connect to a Brightpearl bundle, all the items within the bundle are added to the sales order and the available inventory allocated. All item prices and tax values are provided by eBay during the order download to ensure the order in Brightpearl matches what the customer agreed to pay. Brightpearl will use the integration tax rules to calculate which tax code to apply. A shipping charge is added as a line item on the order. If tax should be calculated for shipping charges ensure that this is selected on the eBay account setup in Brightpearl - go to Settings > Brightpearl Apps > eBay to edit account settings. When activated the company default tax code will always be applied. If tax is not charged on shipping the Not Rated tax code will always be assigned. 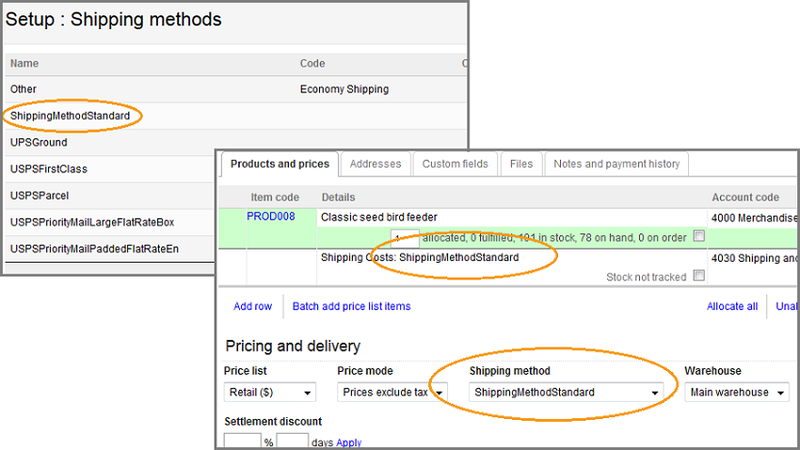 When an order downloads into Brightpearl from eBay you can automatically populate the shipping method field. This will allow you to filter your sales list by shipping method and prioritize fulfillment and shipping. The shipping method is assigned by searching for a method in Brightpearl with the same name as the one applied to the order in eBay, if a matching name is found it is added to the drop-down field on the order in Brightpearl. The charge is applied as a free text line item with the amount the customer actually paid, it is not related to any shipping prices set on the shipping method in Brightpearl. When creating your shipping methods you need to name them using the name as it appears in eBay, alternatively you can use the eBay service name. You can find a full list of the eBay service names here. As of version 4.90, Brightpearl supports the eBay Global Shipping Programme (GSP). An eBay distribution centre will be set as the order delivery address to ensure your goods-out notes and shipments automatically go to the correct place. Any changes needed to the shipping cost on the order are not currently handled and will need to be edited manually. An order in Brightpearl will be marked as paid when the payment method is PayPal. Although Brightpearl has a separate integration with PayPal, the payment details are provided by eBay. Downloaded eBay orders will display the order reference in the Customer ref field of the Brightpearl order. It is formed of the listing ID followed by the eBay order reference. It is important that is reference is not changed in Brightpearl as it is used to link shipping updates to the order in eBay. Order comments added during checkout will not be download with the order into Brightpearl. These can be manually added to the order in Brightpearl. An order can be deleted in Brightpearl and redownloaded from eBay as long as it was placed within the last seven days and is after the order download start date on the channel in Brightpearl.